Straight, healthy teeth are considered to be the fundamental building blocks of an attractive, confident smile, but not everyone is born with teeth that are properly aligned. Adults and adolescents in particular may feel insecure about their crooked teeth, but hesitate to seek orthodontic treatment and traditional metal braces. At Complete Cosmetic Care Dentistry in Sapulpa, OK, Dr. Parnam Mohanna and Dr. Dalia Georgy offer a preferred alternative to metal brackets and wires. 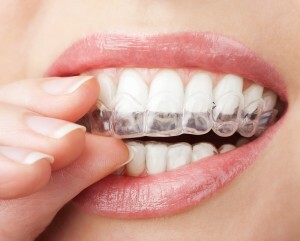 Invisalign clear aligners allow you to enjoy the benefits of straighter teeth in a way that suits your lifestyle. A one-on-one consultation with Drs. Georgy and Mohanna will help determine if Invisalign clear braces are the right choice for your individual circumstances. Invisalign has been proven to correct a variety of common alignment flaws, including mild to moderate crowding, gaps, overbite, crossbite, underbite, overjet, and open bites. In some cases of severe misalignment, alternative orthodontic treatment may be deemed necessary. Our experienced doctors will assess your teeth, gums, and jaw before continuing with treatment planning, answering any questions you may have regarding the Invisalign process along the way. Unlike traditional metal braces, Invisalign clear aligners are made of smooth, comfortable plastic that is molded specifically to match your unique dentition. The aligners are removable for cleaning and ease of eating, and are virtually invisible to those around you. You can feel free to smile in complete confidence while you undergo your orthodontic treatment, enjoying the full benefits of straighter teeth after as little as six to 18 months. If you are interested in learning more about Invisalign treatment in Sapulpa, OK, contact our office today and schedule your initial consultation with Drs. Georgy and Mohanna. From our conveniently located, family-friendly dental practice, we happily serve patients from Jenks, Okmulgee, Tulsa, Glenpool, Mounds, Keifer, and nearby areas. We look forward to getting you started on the path toward a straighter, more beautiful smile!